3 in 1 knapsack mode to meet your different needs. An luggage sleeve is designed on the back. Suitcase strap can secure laptop backpack tightly on suitcase. 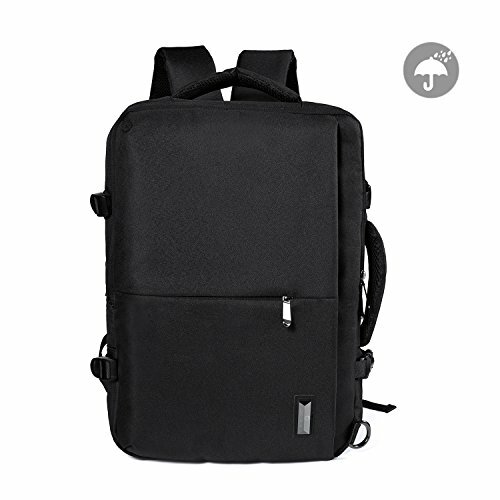 It's normal that it's a laptop backpack for travel has a large enough space.While it extend,it will like a small suitcase but more portable, about 35 L that you can put your personal clothing in. It is a very convenience to take this suitcase bag for business and travel, take it and just go. ★FLIGHT APPROVED COMPRESSION BACKPACK: 16.5 x 13 x 4.7(max9.5) inches, 35L Capacity. Designed to fit the maximum size allowed on an IATA flight, fits in the overhead compartment as well as the under seat as storage in flight. 1 backpack inside the package when you order. If you have any questions about this product by Syntrific, contact us by completing and submitting the form below. If you are looking for a specif part number, please include it with your message.